Anyone know about this brush? The label on this Chubby 3 is older. Can anyone tell me about it? Is it Pre-Vulvix? Yes, sir. It has the lampblacked marking, so that brush is pre-2009. Any other estimate would be pure speculation on my part. Has the Simpson quality stayed the same post Vulvix? Are earlier brushes more desirable? Since it's harder to lay hands on Somerset era Simpsons, they do command a premium in the marketplace. There are differences between the two eras, and the same brush model can be different. I have 58's from both, and they feel different (higher loft and less dense on the Somerset). Personally, I find the current Simpsons to be very high quality, though there are certainly some (very vocal) detractors. Somersets are often viewed with a "good old days" lens, IMO, though the quality control of Somersets toward the end seemed to have been lacking. Very interesting, thank you. Venture a guess what era this particular brush was manufactured? Purely speculation, but I would guess sometime in the last 20 years. The handle is pretty white, and doesn't look to be turning butterscotch, so it's either young or uses a different handle material. 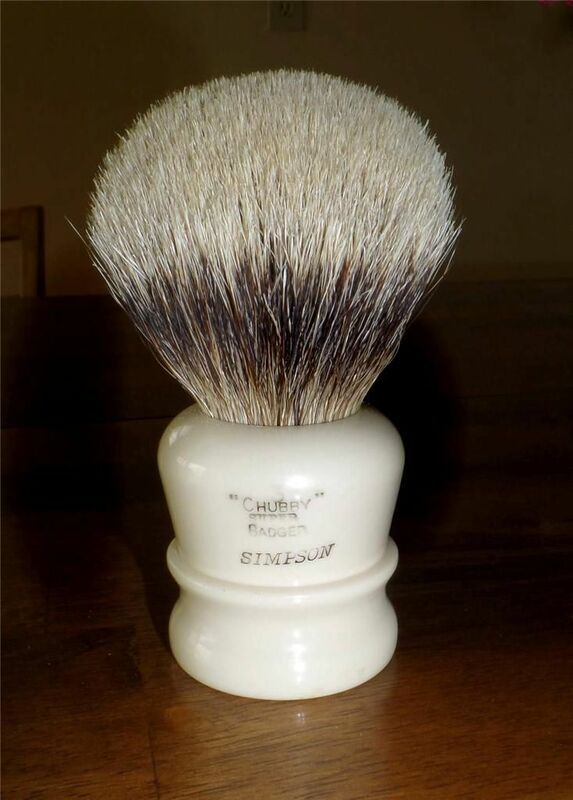 You have a "Carter era" Simpson, AKA pre Vulfix brush. That brush is at least 5 yrs old, but it doesn't appear to be an original Simpson made by the Simpson family (prior to David Carter taking over the company). Carter purchased the company in 1990 and produced brushes until Vulfix took over in 2009. The brushes that turn butterscotch are made of catalin, yours is acrylic resin. I love the Somerset Simpson's. Sweet brush man! I ask because I just got 2 brushes Mark dated to be in the 90's and couldn't figure out if that is defined as Somerset or Carter or both. Somerset covers the entire production period up to the move to the Isle of Man. If your brushes date to the nineties, they are Carter era brushes. David Carter owned the company from 1990- 2009.
primotenore, so have you used and enjoyed the brush yet? I got a NOS and just like looking at it haha.. I will eventually! No I haven't and won't. The brush was up for an auction and I wanted to inform myself before bidding, but was woefully outbid. Thanks all, I did learn something however. Small spots of imperfection & discoloration were common during the older days before Mark and his team took over the company. It is part of the brush and you just have to learn to love it. darn! lol... one can wish. Thanks for lending your knowledge!! The shape of the E3 I received isn't as smooth as the current E3 in look and feel, you can feel ridges on the gradual angle change as the knob widens to the base so you can see the manual workmanship from the craftsmen on display. Its nice to have a piece of history that's new (or was till few days ago . And its not a shedder so I'm very happy about that.